Brazen thieves have put a landscaper out of business temporarily after they gutted his van during a daylight robbery from the car park of Marlborough House. 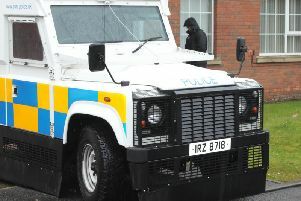 The man’s red Transit van was in the car park next to the government building in Brownlow when the thieves struck, within sight of Craigavon Courthouse. He had lent his van to his dad - a Housing Executive employee - who was using the vehicle to commute to work. The devastated father said: “I had got a lend of my son’s van while my car was off the road for repairs. And gutted is the operative word with around £5,000 worth of tools stolen - including a Rover mower worth £880 and a Stihl chainsaw valued at £900. Other tools stolen included two leaf blowers, a strimmer, long reach hedge trimmers, cordless batteries, jigsaw cutter and hammer drills. The theft happened on Wednesday, January 16 between 9am and 4pm, with a white van spotted with two men acting suspiciously beside the landscaper’s van at around 11am that morning. A second white van was spotted around the same time, facing the Rushmere car park. It’s thought the thieves may have pulled up beside the landscaper’s van and emptied its contents into their vehicle. The landscaper’s dad said: “This car park used to have a security guard at the gate but now they only cover the building. Anyone who can help trace the thieves or stolen tools is asked to contact police on 101.